**The Pic Square that I offer will only be free with the purchase of a Pic40zip. There will be a $5.00 charge to add it to the Pic35 and Pic65 orders. #18 gauge steel clips, 1/4" PVC, heavy duty cloth, rust resistant zippers, aluminum handles and TWO DAY SHIPPING! 2. Time: The Pic can pick up balls at a rate of 20+ balls per 10 seconds. 3. Safety: I quote Dr. Steward McGill, world renowned back and spin expert: "The disc will take only so many binds before it is damaged." Repetitive bending to pick up balls puts all backs at risk of injury. 4. Individual Improvement: The Pic provides individual practice sessions. Whether you using a practice board, or a machine, you don't need anyone else to work to improve any phase of your game, but, you need a tool like the Pic! 5. Bottom Line - Practice matters: I don't care what level of play you are at, practice matters. If you want to improve, or maintain a level of play, you need the Pic for valuable practice sessions. So, that it! I not only thank my past customers for their purchasing of a Pic, but, most importantly, I thank them for their great comments about the value of a Pic and its impact on their overall game. It is satisfying to receive such comments. And, finally, if you're new to this website, you now know why 400+ players understand the value of a Pic35, Pic65. or a Pic40Zip. 1. State the Pic(s) you want to purchase. 2. Email your name and full address as to where to send the Pic(s). And that's it! I like it this way because if there's a mistake in the address, most often, it will be at your end. The email helps me to track my sells. And finally, do not worry about payment. I will send out the Pic as soon as possible and the box will have an invoice inside with the final payment due. Any pre-order questions, call me at 330-720-4180, which is my cell and I have it "attached" to me 98% of the time!!! 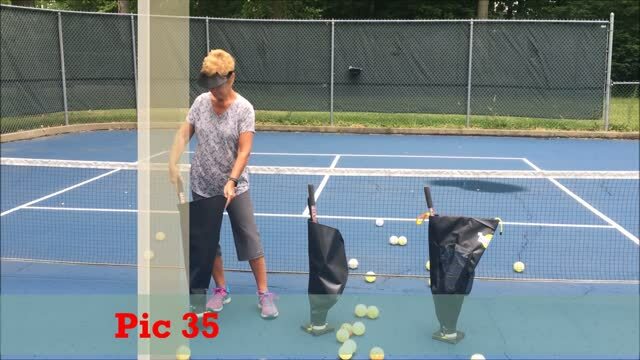 Judy is using the Pic35 to pick up the balls that have accumulated in the corner of the court. Above: Dave describes the three Pics and Judy shows the differences between them and how they work in picking up balls.